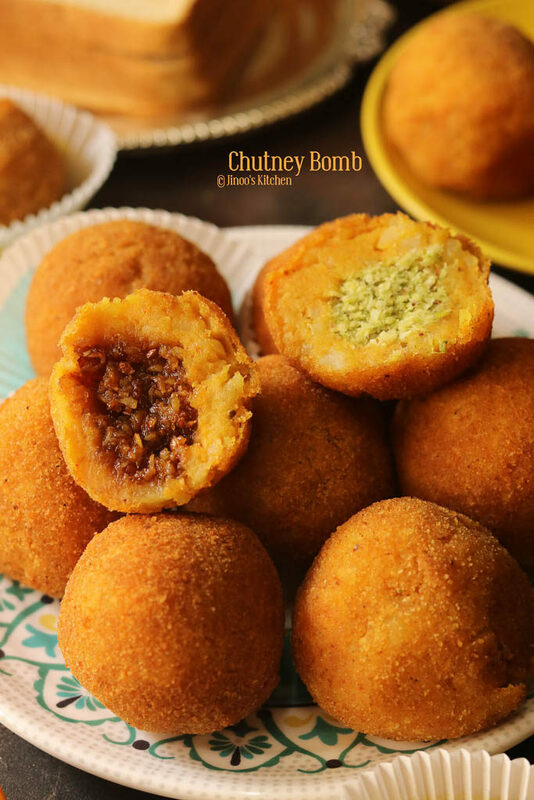 Chutney Bomb recipe | Chutney stuffed snacks recipe with sweet and savoury chutney stuffing. 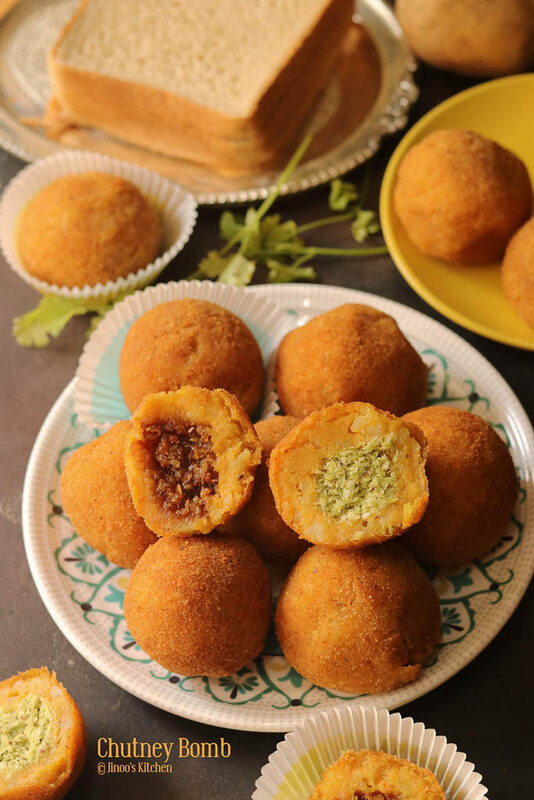 The outer covering with bread and potato this is one of the easy and tasty snacks recipe to make for tea or for your guests. I had this snack from one of my parents colleague who had packed it for me when my parents visited them. I simply loved it and asked my mom for the recipe. This happened around three years back. Every time I plan for it and miss it somehow. Finally made it but with the extra add-on of sweet version of it too. You can stuff any chutney variety that will go with potato and bread covering. Sweet chutney was nothing but the sweet coconut pooranam that we stuff for ela ada or sweet kozhukattai. 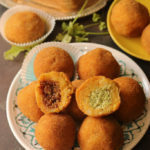 I had the melted jaggery that i prepared with cardamom powder and dry ginger powder. Use it for this sweet filling with roasted coconut. Grind everything given under the “For savory chutney” section to a thick coarse paste without adding water. For sweet chutney. Roast the grated coconut in oil until reddish and then add melted thick jaggery syrup. In a mixing bowl, Take slices of bread and add little water. Mix to a smooth dough. Add mashed potatoes, salt, chilli powder, cumin powder, chaat masala, and garam masala. Mix well to a smooth dough. Scoop a portion of the dough and flatten it. Fill the chutney in the middle and close it on all sides gently but firmly. Dip it in corn slurry and roll it over the bread crumbs. Prepare the balls and deep fry until golden brown. 1.To make the spicy/savory chutney: Grind grated coconut, green chilli, ginger, coriander leaves, salt and sour curd to a thick and coarse paste without adding water. 2. To make the sweet chutney, roast the grated coconut in coconut oil until golden brown and add thick jaggery syrup. Mix well and cook to a thick consistency. 3. In another mixing bowl, Take 4 wheat breads and add few tbsps of water to it. Crumble it and make a dough. 4. Add boiled and mashed potatoes, turmeric powder, chilli powder, chaat masala, cumin powder and garam masala. Mix well to a smooth soft dough. 5. Scoop out a ball of dough and flatten it. Make a pit in centre. 6. Place the savory/sweet chutney and close it on all sides and make a smooth ball. 7. Bath it in corn slurry and roll it in bread crumbs. 8. Prepare all the balls and deep fry it in hot oil (medium flame). 9. Keep turning sides so that all sides are evenly cooked. Take out and strain the excess oil. Serve the chutney bomb fresh ! No chutney needed!